UPPER EAST SIDE — The new Whole Foods opening Wednesday on the Upper East Side will be the first in the city to let customers order and pay for their food on tablets. Visitors to the 39,000-square-foot store at 1551 Third Ave. near East 87th Street will be able to order sandwiches, juices, housemade quiches and pizza on tablets at kiosks located throughout the ground floor. 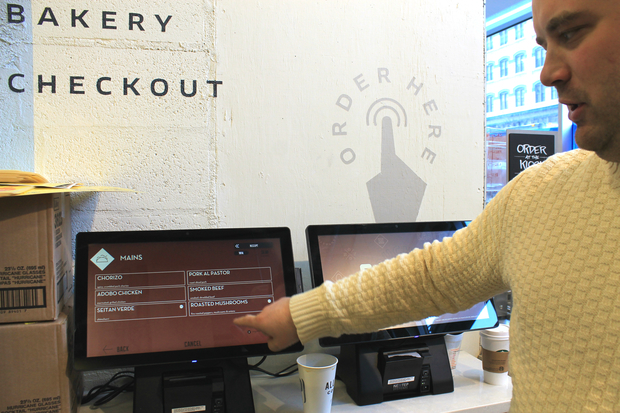 After paying for the food at the kiosks, customers will be able to track their order on screens posted on the walls. “It helps make it quick and convenient for those who just want to grab lunch,” said Whole Foods spokesman Michael Sinatra, who noted that this is the chain's first branch in the city to have the tablet system. The Upper East Side location will also be the first to offer a line of fruit-infused water, which will be made in-house. Flavors will include blackberry mint, lemon cucumber, honeydew raspberry and mango lime. “Infused waters have gotten really popular, so we decided to make our own in the store,” Sinatra said. In addition, the store is launching a cheese club for $49.99 per month, where members receive a box with 3.5 pounds of a local or domestic cheese, a jar of jam and crackers. Every item will be different each month, Sinatra said. Also for the first time, the new Whole Foods will offer fresh-cut smoked salmon so that customers can customize the amount and thickness of the cuts, Sinatra said. Smoked salmon from Catsmo and from Brooklyn’s ACME Smoked Fish can be cut to order and are both priced at $5.99 per 1/4 pound, he said. The store will also have a booth focused on quiche, offering sweet potato quiche made with caramelized onions and gruyere, a spinach and ricotta quiche and a four-cheese quiche — all made in-house. The ground floor focuses on prepared food, a mezzanine level offers a cafe and seating, and the top floor will be dedicated to groceries including produce, cheese, meat and fish. “By having food and groceries separate, people can easily be quick and out of the store,” Sinatra said. The new location will be Whole Foods' ninth store in the city. Three more outposts will be opening in the next two years, near Bryant Park at 42nd Street and Sixth Avenue, in Harlem at 125th Street and Lenox Avenue and in Williamsburg at North Fourth Street and Bedford Avenue, Sinatra said. The new store will celebrate its grand opening with a bread-breaking ceremony beginning at 8:45 a.m. on Wednesday and will give out plenty of samples during the day. The store’s normal hours of operation will be from 8 a.m. to 11 p.m., but those hours may later change.